E.Z. 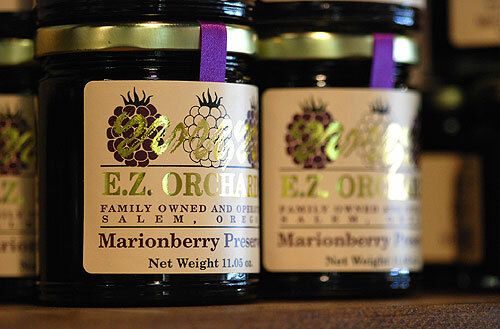 Orchards has developed a line of delicious fruit preserves using local berries and orchard fruit. They make several varieties, all of which are composed of a short list of simple ingredients--- fruit, sugar, and maybe a little pectin. All of their preserves are well balanced and retain a pure fruit flavor. At Rafns' we carry E.Z. Orchards Apple Butter, Pear Butter, Peach Preserves, and Marionberry Preserves. We are particularly fond of using these preserves on toast with butter or as an all-purpose breakfast condiment. Learn more about E.Z. Orchards by visiting their website: www.ezorchards.com.